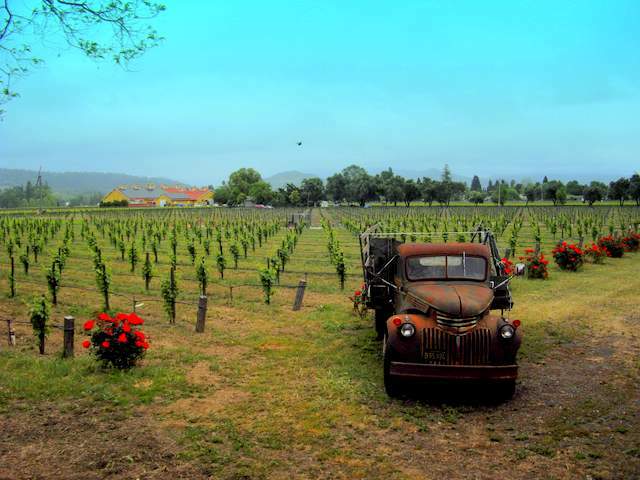 Napa Valley, California is one of the state's most visited tourist attractions because of its beautiful rolling hills, picturesque vineyards and winery after winery after winery. If you'd like a unique Napa Valley experience, we recommend that you try the Napa Valley Wine Train where you can sit in antique train cars while enjoying dinner, wine and some of the best sights in Napa Valley. The Napa Valley Wine Train provides a relaxing, three-hour, thirty-six mile round-trip journey from the historic town of Napa, through one of the world's most well-known wine valleys to the quaint village of St. Helena, and back again. While traveling, Napa Valley Wine Train guests enjoy "a freshly prepared lunch or dinner inside a fully restored 1915-1917 Pullman Dining Car or 1952 Vista Dome car as they pass the vineyards and wineries of Napa Valley." The tracks upon which the Napa Valley Wine Train runs were originally built in the 1860s. During the three hour Napa Valley Wine Train tour, guests travel through five towns - Napa, Yountville, Oakville, Rutherford, and St. Helena. The antique train has two engines, three kitchens, and a collection of early 20th century rail cars. Speaking of the antique rail cars, Chef McDonald said, "The 1952 Super Dome car is quite a rare find - there are only 18 in the world!" Intimate, special and above the crowd. Almost 180-degree Napa Valley vistas under the antique dome windows. Enjoy wine pairing events and romantic moonlight dinners. Relive the luxury and tradition of railroad dining as the steward seats you in the Gourmet car. White linen service for half your journey. The other? The comfort of the lounge car. Taste the barbeque side of Napa Valley gourmet in the Silverado car. This open air railcar exudes a relaxed atmosphere, with a western theme and sliding windows. Silverado Car: Train fare, a multiple course gourmet meal, (1) glass of private label Wine Train wine or a beer, and on board coffee and tea. Gourmet Express: Train fare, a multiple course gourmet meal and on board coffee and tea. Vista Dome: Train fare, a multiple course gourmet meal, Vista Dome upgrade, (1) glass of sparkling wine, and on board coffee and tea. Winery Tours: Train fare, a multiple course gourmet meal, on board coffee and tea, and a tour and tasting at the specified winery or wineries. Special Events: Train fare, a multiple course gourmet meal, on board coffee and tea, and event programs and features. For more LGBT information in Napa Valley, be sure to visit http://www.outinthevineyard.com where you will find " an experiential Wine Country Tour and Event company promoting positive LGBT lifestyles and offering exclusive, luxury itineraries and events to the discriminating gay and lesbian traveler and our friends." Out in the Vineyard also hosts The Big Gay Train LGBT winemakers' dinner on board the Napa Valley Wine Train. This special event, hosted by Out in the Vineyard, includes a fresh, multiple course meal exclusively designed to pair with wines from some of the most prominent LGBT winemakers in Wine Country. The featured winemakers will be joining guests on board to socialize and answer questions about their craft. The Big Gay Train is a seated with others event which creates the perfect environment for meeting new people and mingling. Watch our video of the Napa Valley Wine Train below.